Remodeling Your Kitchen- Where Should You Start! 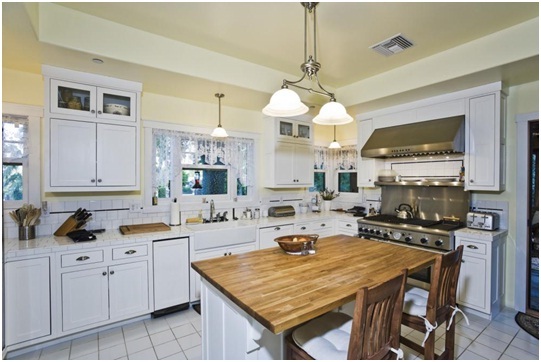 One of the costliest yet equally important rooms to remodel in the house is the kitchen. It’s where the best part of the day is: food! Many families get together in the kitchen at breakfast or dinnertime, but depending on your reasons to remodel it, and how much you use the kitchen, your requirements can change. One of the most important things to consider before embarking on a kitchen remodeling project is the layout and spacing. Depending on your family size, how many people use the kitchen at one time and the frequency with which it is used, layout and spacing will help you determine the kind of cabinets (and how many) you need and the type of flooring that will suit you best. One of the best layouts for the kitchen is to place the sink, refrigerator, and stove in a triangular pattern to save steps. If many people in your family like to cook, consider adding in a secondary workstation for them. The choices are endless when it comes to kitchen remodeling, but the real deal is aligning them your needs! After you’ve decided the layout and the space needed in the kitchen, the next thing you need to determine is what you intend to achieve with the remodeling project. There is no hard and fast rule to this and no one can tell you to spend more money on the stove rather than the cabinets. It is a choice that you have to make and one that differs because of your reasons. If you’re doing a kitchen remake for the sake of increasing your home’s resale value, you might put money on the flooring, slabs, and cabinets more than other things. These are things which show – and the fancier the better. However, on the other hand, if it’s for the purpose of your convenience, consider spending on a new and improved stove, a second sink, and full extension drawer glides, anything that makes cooking easier and more convenient. Remodeling a kitchen can be quite a task and will cost you big bucks, but remember your goals for doing it. What can really help you achieve your dream kitchen is allocating your costs in the right way. This you can do relatively easily once you’ve identified your needs. Divide your project into electrical, cabinets, walls/ceilings/doors, design and appliances categories, and set budget limits for each. Doing this should help keep you within your means and select your best options when it comes to making decisions for each category. We understand how overwhelming kitchen remodeling can be for homeowners and we try our best to play a positive role throughout the process by helping you each step of the way. For our home remodeling services, call us today for a free consultation at (417) 204 -4949.